The basic technique is to use clay or terracotta pots of various sizes. Fit them one inside the other, or one against the other, so that they make the shape of a man. Attach the pots to one another by threading string or rope through the centre of each chain of pots. A variation on this scarecrow-making technique is to use plastic flower pots. In this scarecrow idea, aluminium cans of various sizes have been strung together instead of flower pots. 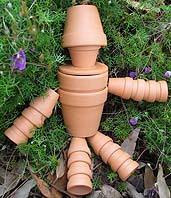 Note: This page includes clay pot scarecrow ideas for you and your kids to make: clay pots, terracotta pots, plastic flower pots and even tin cans, aluminium cans or drink cans can be used with this scare crow making technique to make cute scarecrow men.